If a photo is worth a thousand photos, a 360º photo sphere is worth a thousand photos to help travelers plan and book their hotels. That's why major hotel brands – such as Best Western International – are spending millions of dollars engaging pro photographers to shoot 360º spherical virtual tour photo spheres of their hotel properties, reports Tnooz. By the end of 2014, Best Western will have 360ºs for all its 2,200 hotels in North America, according to the company's press release in December 2013. Yet, many major hotel brands, Independent hotels, B&Bs and vacation rentals simply go without 360ºs because of the cost, time and expertise required to shoot professional quality 360ºs of their properties. Now imagine an easy, fast and affordable solutions that could dramatically reduce the cost, time and expertise to create 360º photo spheres. Do it yourself (DIY) 360º photography solutions will be embraced by major hotel brands; timeshares, vacation rental home owners; and convention and visitor bureaus (CVBs) – to help with their visual storytelling. When the ball drops at midnight in Time Square to signal the start of 2015, it will also get the ball rolling for the year of DIY 1-click 360º spherical cameras that require no training or special photography skills to use. Simply touch the button! The stitching is done in the the cloud. While 360ºs can be shot using a pole or tripod, the Panono can also be tossed in the air, which makes it perfect for capturing moments in time at events. For examples of images shot with a prototype, please click here. Panono has Wi-Fi and built-in Flash drive. Panono is expected to sell for $599 and be available in September 2014 in the Panono Online Store (preorder now for $549, plus $30 shipping.). Geonaute 360 (Geonaute.com) – a little smaller than a baseball, the Geonaute 360 features three 8 megapixel sensors and in-camera stitching. The hands-free three-lens camera creates 4096 x 2048 pixels JPG 360º x 150º photo spheres. The Geonaute 360 mount is compatible with GoPro accessories. For examples of images shot with a prototype, please click here. The camera includes a 10 second timer and 360º burst mode of six spheres per second. Geonaute 360 includes microSD card and microUSB for output. 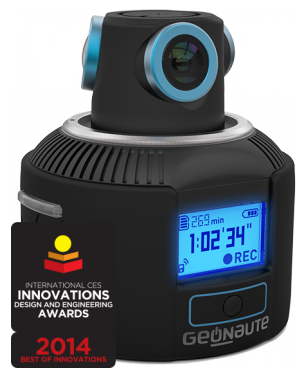 Pre-orders for the Geonaute 360 camera are being accepted for $499 in the Geonaute Online Store. The company expects to begin shipping in Spring 2014.
iBi (Tamaggo Inc.) – shaped like an egg for the palm of your hand, the iBi shoots 360º x 200º with a single click via a 14MP sensor. Pre-orders for iBi are available within the Tamaggo Online Store for $499 (US and Canada) with first deliveries in early 2014. For examples of 360º images shot with the iBi, please click here. 360Fly – (EyeSee360 + exclusive distribution arrangement with VOXX Electronics) – slightly smaller than a base ball and weighing just 4.2 ounces, 360Fly was introduced at the 2014 International Consumer Electronics Show. The 360Fly sensor is 12.4MP using custom glass lens with a field of view (FoV) of 360º x 240º with an f/2.5 aperture. The 360Fly connectivity includes Wi-Fi, Bluetooth, and a base station with USB 2.0. Ricoh Theta (Ricoh Company, Ltd.) – slightly bigger than an Apple TV remote, this 1-click two ultra small, proprietary lens camera shoots 360º photo spheres. Images can be shared wirelessly via Wi-Fi and Bluetooth and is powered by an internal lithium ion battery chargeable via USB cable. “Ricoh Theta will automatically adjust the image orientation so that you don’t have to worry about how you’re holding the camera. You may simply take pictures at the precise moment you choose,” says the Ricoh Theta website. The Ricoh Theta is $399.95 plus shipping– available now – in the Ricoh Imagining Online Store. For examples of 360º photo spheres shot with the Ricoh Theta, please click here (and scroll down). We Get Around offers bundles that includes a Ricoh Theta or Bublcam 1-click camera. If you prefer, we can substitute Panono or 360cam. For hosting, We Get Around uses the Sphere platform – the YouTube of 360º photo spheres. While hotels in particular – and the travel, tourism and hospitality space in general – are a perfect fit for DIY 360º photo sphere photography, tech savvy residential and commercial Realtors, educators and meeting and event planners will find this next generation in virtual tour camera photography technology beneficial to help their clients make more confident decisions. Below are videos about each of the 360º photography gear solutions described above. The videos are from the respective manufactures. Squito – and related technology – have been in development since 2008 and publicly displayed (“smart spheres for reconnaissance and recreation”) in September 2009. The company has a working prototype. “Since Squito is not yet in production, we have not announced pricing, availability or published a specification,” says Hollinger. providing you with embed code for your website. Below are additional details about the Bublcam Take 100 for 12 Months Bundle. This bundle includes everything you need to create great 360º virtual tour photo spheres, including: We Get Around handling the post production such as replacing the tripod with your logo and adding clickable directional arrows within your virtual tour (e.g. go room to room; from inside to outside; from location to location); hosting of your 360ºs that includes gyro control on mobile devices and providing you with embed code for your website. 1 Bublcam 360º photo sphere 1-click camera (to shoot your own 360º virtual tour photo spheres). Bublcam manufacturer anticipates shipping in August 2014. 1 XShot SXP2 Pocket Camera Extender – opens to 30.5" and closes to 6.5"
We add clickable directional arrows within your virtual tour (e.g. go from room to room). We host up to 100 of your 360º for 12 months; then $4.95 per 360º photo sphere per month. Your hosting subscription begins on the first of the month; after you receive the Ricoh Theta. You receive embed code for your 360ºs for your website. Unlimited viewing of the 360ºs. Unlimited sharing of the 360ºs via social media such as Facebook, Twitter, Pinterest, Google+ and email. Pricing based on pre-payment via this online shopping cart. Plus tax, if applicable. 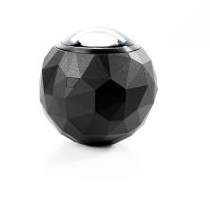 Video: Bublcam 1-click 360º photo sphere camera. Video: 360Fly from 360Fly on Vimeo. Video: Ricoh Theta 1-click 360º photo sphere camera. Video: Motrr Galileo iPhone robot paired with the Sphere app to record 360º photo spheres.